Easy illusion projects for magicians for under $500. 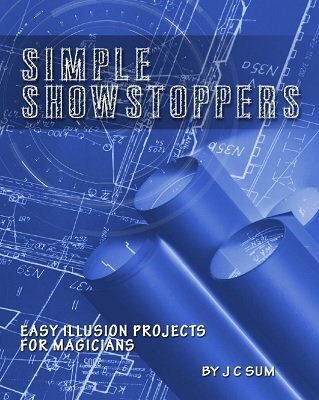 While J C Sum is known for his modern illusion designs and solutions for working professionals, he has written an ebook for illusionists and magicians looking for simple but effective illusions for theatrical stage shows. This ebook is a fantastic introduction to the world of modern grand illusion but also contains inexpensive illusion ideas for experienced illusionists. If you have a theatre show, cruise ship show, charity show, talent contest or magic club performance where you want to stage a large-scale effect, you will find something of value in this ebook. The best part is that all the illusions in this book can be built easily and inexpensively (under $500 each) but are presentable enough for a professional show. None of the illusions are made from cardboard! The ease of putting the illusions together will allow you to spend your time and effort on the presentation, choreography and performance of the illusions. Besides appearances, disappearances, transformations and a unique "Sword Box", the book details J C's original Black Art Flap Table, an innovative design that allows you to achieve the same effects of a traditional black art table but with the ability to see through under the table, before and after the effect, without the need of openings in a backdrop or trapdoor in the stage. For easy understanding, the book includes full building plans, material lists and performance instructions. 1st edition 2013, 2nd edition 2014, 50 pages.